Maple sugar pie was a real treat for 20th century Ojibwa camping in the bush. Anyone who has lived a spartan life in a bush camp knows that a bite of something sweet .....maple sugar pie, for example...is a wonderful thing. Whether they were out hunting, trapping or just moving from one part of the bush to another, my friend's Kokum always carried a supply of soft maple sugar with her. She didn't have all the utensils you're used to and she sure didn't live close to a supermarket but she knew how to 'make do" around a campfire. One of her favourite treats was a maple sugar pie. It wasn't made in a pie plate. 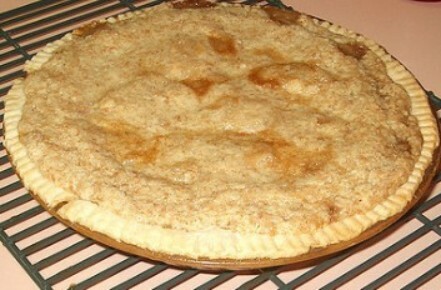 It didn't have pretty fluted edges like the pie in the photo. It didn't look like your mother's pie ...but that's what she called it and who was my friend to argue...she just enjoyed it when it was offered! Kokum's pie crusts, by necessity, were somewhat creative. She knew how to make a flaky crust using flour, lard, a little salt and some water but 'substituting' was a way of life and an absence of store bought 'fixins' didn't ever stop her. A flour, of sorts, could be made by drying bulrush roots and grinding them in a shallow hollow in one of those massive rocks you see in pictures of the Canadian Shield. Bulrush is really ground to be used as a thickener for soups and stews, but the result could be used to extend real flour in a pinch. Very finely ground manomin (wild rice) when mixed with a bit of water and perhaps a duck or a bird egg could be made into something resembling a crepe. If Kokum wanted to call it a pie shell, so be it. Ojibwa women occasionally purchased real lard, but it was a simple matter to render animal fat and store it in small birch bark containers and spoon it out as needed. In retrospect I suppose the flavours were interesting but no one gave it a thought at the time. Divide the dough into 6 balls and roll or press them into flat circles. Spread a heaping spoon full of maple sugar on half of the circle. You can leave it like that and fold them over to make crescent shaped pies and even add a few berries if you want. If you have a cast iron pot with a lid, cover the bottom with an inch or two of small stones or one flat river rock and heat the pot over red hot coals. The stones on the bottom of the pot help prevent scorching. Lower the pies... one or two at a time depending on the size of your cast iron pot...onto the hot stones, cover with the lid and bake for ten minutes. If they are flat pies carefully lift them out and let them cool on a plate. If they are crescent shaped pies, carefully turn them over and cook for another five minutes. A slender sharp pointed stick is a handy tool to help you take the maple sugar pies out of the dutch oven. Don't bite into them right away or you'll be sorrrrrrrrrrry! They're hot! Maple sugar candy was another one of the treats she made.